It may come as a surprise to know that walnuts are considered one of the healthiest foods out there. Not only are they packed with protein, fiber, and loads of omega-3, studies have shown that they have definite positive impacts on decreasing cholesterol, decreasing risks of blood clots, and improving blood pressure. In addition, nutrients contained in walnuts have been identified as aiding in cancer prevention and contributin to bone stability and strength! Even though we think of nuts as high in fat, walnuts are proven to be helpful in losing weight and preventing obesity when eaten in daily ranges of one to three ounces. Our medium walnut pieces are an excellent way to add a nutritious, delicious crunch to a meal while remaining healthy. 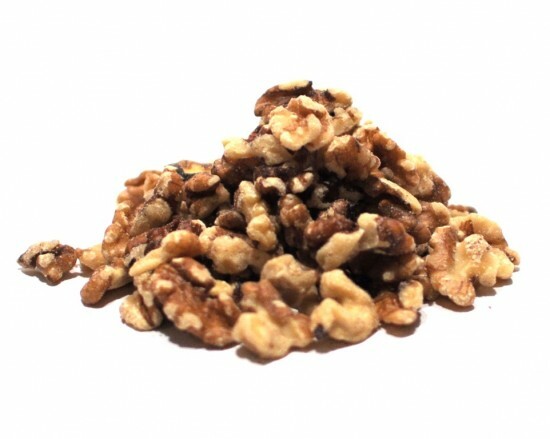 As the name suggests, these walnuts have been chopped into medium sized pieces, so if you’re looking for larger or smaller options we do sell whole walnut halves in bulk, baker’s walnut pieces (which are smaller), or a combination of whole halves and these medium pieces. No matter how you slice it, walnuts are a fantastic way to create a memorable meal without paying for it at the waistline.